Physical characteristics: The red-billed scythebill is one of the larger woodcreeper species, with a body 9.5 to 11 inches (24 to 28 centimeters) in length. It has a long tail and a long, slender, downwardly-curved bill. Its back and tail are brownish red in color, while the belly is a lighter cinnamon-brown shade. The head and throat are covered with brown and white streaks. Geographic range: The red-billed scythebill has a wide range, occurring in portions of Panama, Venezuela, Colombia, Ecuador, Peru, Bolivia, Brazil, Paraguay, and northern Argentina. Habitat: The red-billed scythebill is one of the most widely-distributed woodcreeper species. It inhabits rainforests, forests, and forests in mountainous regions up to a height of 6,600 feet (2,000 meters). Diet: Red-billed scythebills eat insects and other invertebrates by picking them off the trunks and branches of trees. 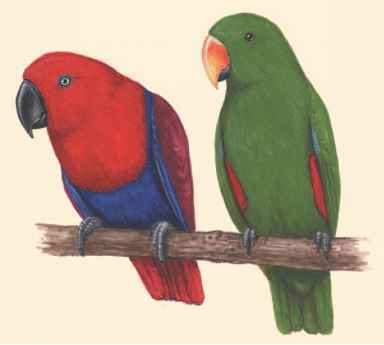 Behavior and reproduction: Red-billed scythebills are either solitary or found in pairs. While looking for food, they sometimes join flocks that include other bird species. Two or three eggs are laid in an abandoned woodpecker hole or other tree cavity. Both parents help incubate eggs and feed nestlings. Red-billed scythebills and people: Red-billed scythebills are not known to have any special significance to humans. "Dendrocolaptidae (Woodcreepers)." The Internet Bird Collection. http://www.hbw.com/ibc/phtml/familia.phtml?idFamilia=107 (accessed on April 25, 2004). "Family Dendrocolaptidae (Woodcreepers)." Animal Diversity Web. http://animaldiversity.ummz.umich.edu/site/accounts/classification/ Dendrocolaptidae.html#Dendrocolaptidae (accessed on April 25, 2004). "Woodcreepers." Bird Families of the World, Cornell University. http:// www.es.cornell.edu/winkler/botw/dendrocolaptidae.html (accessed on April 25, 2004).